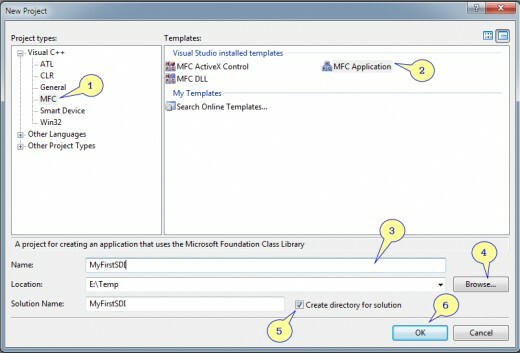 MFC stands for "Microsoft Foundation Class" libraries. These libraries are useful for creating rich windows based application. The foundation classes were introduced in early 90 and lot of software development firm used it. Till today, there is a lack of engineers available to maintain the legacy code (Huge volume of were written in MFC till 2006). In this hub, I will explain creating your first MFC Application and in the next coming hub pages, I will give more step-by-step based examples. 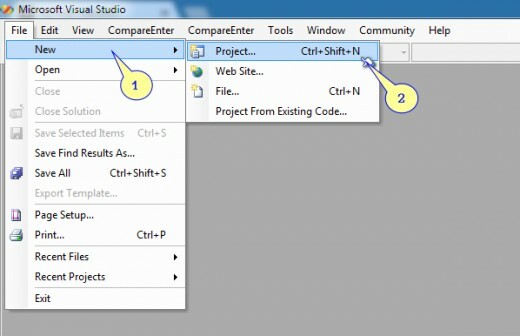 Here, I used Visual Studio 2005 for this example. 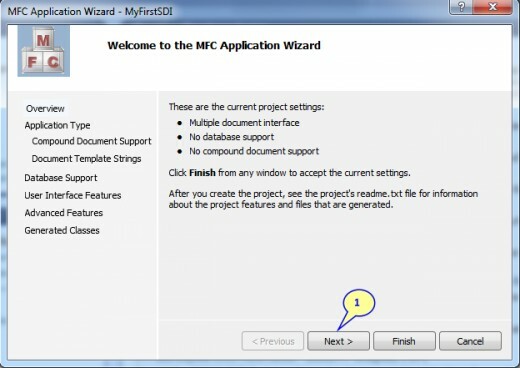 1) From the Project Types, expand Visual C++ and select MFC. 2) Select "MFC Applications" from the right side template screen. 5) Make sure "Create Directory for Solution" is checked. Now, a project wizard starts and we have to interact with it in the next coming steps. 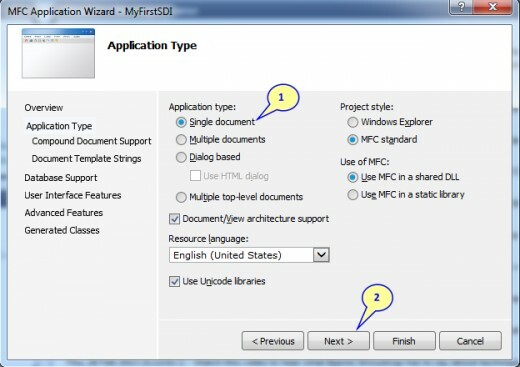 This wizard collects information from the user to create an initial startup application. 4) The Wizard is in "Compound Document Support" screen. Accept the defaults and click next. 5) The Wizard is in "Document Template Strings" screen. Here also accept defaults and click next. 6) The Wizard is in "Database Support" screen. Accept the default settings and click next. 7) The Wizard is in "User Interface Features" screen. There are multiple options here and I will explain those in a different hub. Click the next button here as well. You can see all these four classes in the screenshot above (Marked as 1). 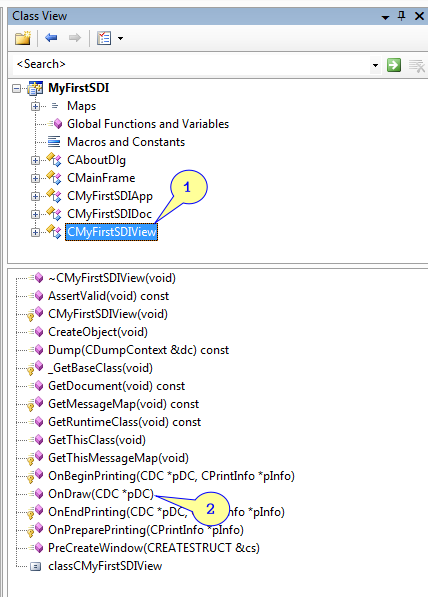 When you click on the class, information such as Class Name and from where it is derived, header and implementation files (.h, .cpp) are displayed in the below area (Marked as 2). Clicking the Finish button ends the Wizard and generates all the classes. The screenshot is showing five tabs. By default, one will get Solution Explorer and ClassView tabs. When you click ClassView tab(Marked as 1), the view changes to class view (Marked as 2). In this view, all the classes generated by the Class Wizard is shown. When you click the Class Name, the bottom pane shows the class members. When you click the Solution Explorer tab (Marked as 3), the view switches to Solution Explorer view. 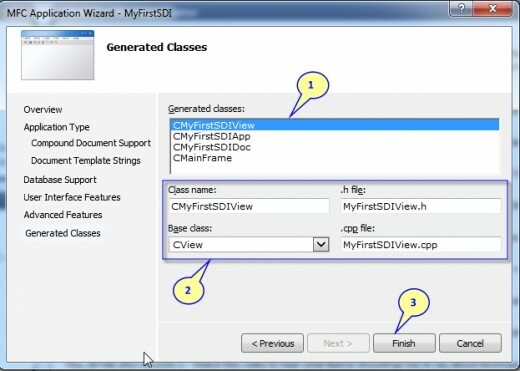 In this view, all the files created by the class wizard is shown. The files are grouped under folder names. For Example, all the header files are placed in the "Header Files" folder (Marked as 4). 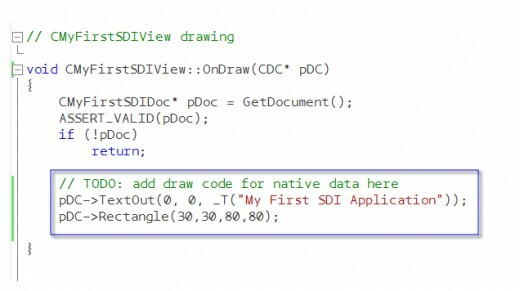 The "OnDraw()" member function gets called whenever the window requires a drawing. For example, let us say a WordPad document is minimised and then maximised. In this case, the document requires a redraw as it comes to the maximized state. Here, first used the "Device Context" CDC member function "TextOut()" to output the text in the windows display area. The first two members state the location of text from the window's top left corner. The last parameter shows the string that needs to be drawn in the client area of the window. 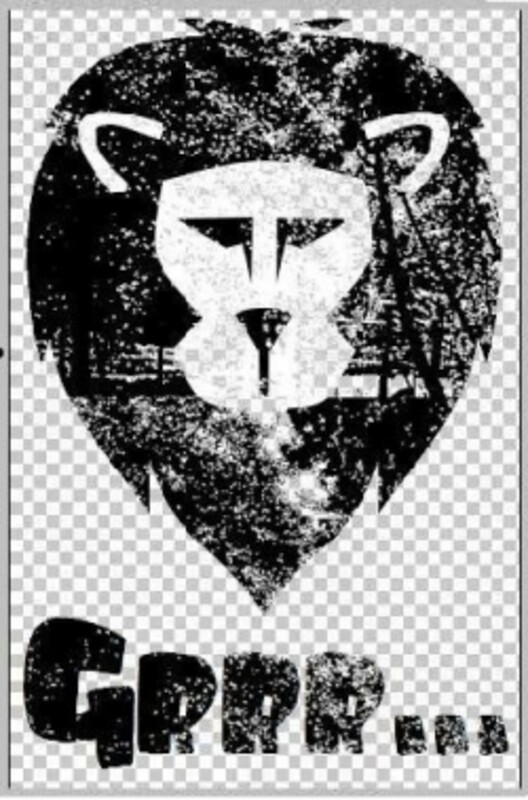 After drawing the text, CDC member function Rectangle() is called. After drawing the text, CDC member function Rectangle() is called. 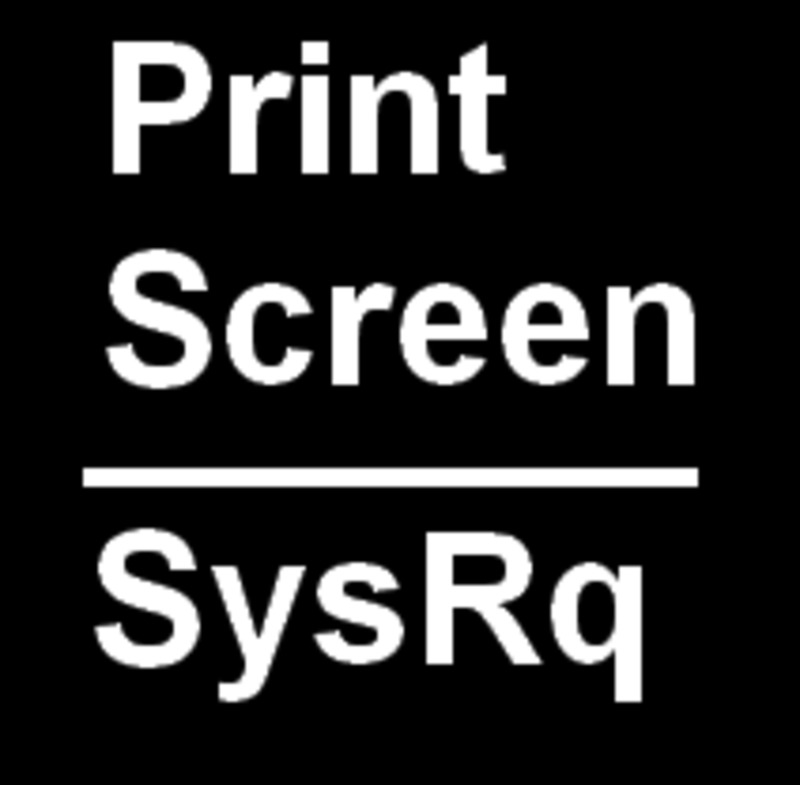 Here, the first two parameter specifies the top left corner of the rectangle relative to the top-left corner of the window and last two parameters specifies the bottom right corner. Now the application is ready with the modified code. 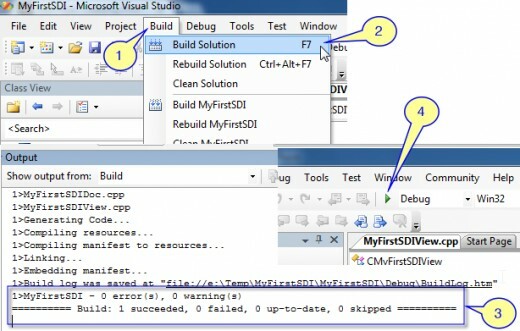 Follow the below procedure to create the executable and run the application (Refer the screenshot - Compile and Run). 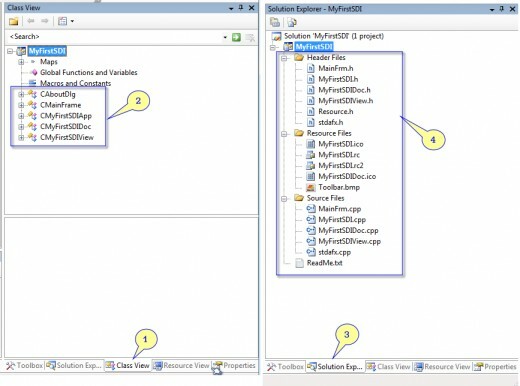 The above step will compile all the files required for the project and generates the Executable file. Once the build process complete, you should see 0 Error and 0 warning in the "Output Window" as shown in Screenshot. One can run the application even there exists warning. But, running the application not with when there is at least one error. 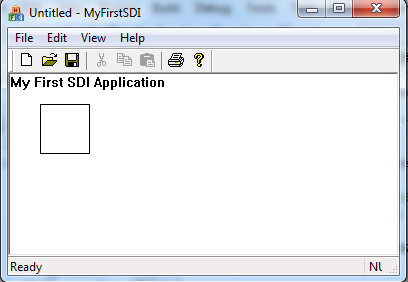 This SDI Application's menu items does not work as we haven't written any code for that. 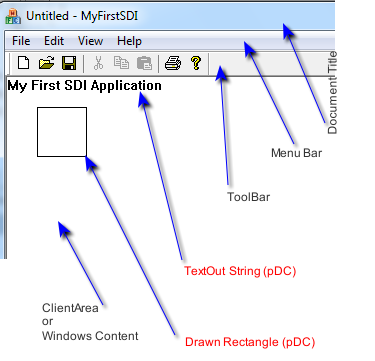 The NotePad and Wordpad are good examples for SDI Application and MFC library is having rich functionalities to develop such an application.